In the first competition of the day, Junior Reading, each team, comprising of three members aged 10 – 14 years read out three chosen passages from “Private Peaceful” by Michael Morpurgo. The winning team was from Chase YFC, in second place came Leek YFC and in third place it was Uttoxeter JNFU. The other competition held for younger members was the Junior Speaking, where members aged 10 – 16 years form teams who act as a Chairman, Speaker and Proposer of the Vote of Thanks. Winning that competition was Eccleshall YFC, closely followed by Leek YFC in second place and Uttoxeter JNFU in third place. For members aged 17 – 21 years, the Situations Vacant Competition was held, based on the members applying for a job of their choice, competitors had to submit a CV and covering letter prior to the competition and then participate in a ‘mock’ job interview. Amy Boothby of Uttoxeter JNFU came first with Eden Gray of Lichfield YFC coming second and Kate Mollatt, also of Uttoxeter JNFU took third place. The Intermediate members took part in a County Brainstrust Competition and after eight teams competed the overall results were Eccleshall YFC in first place with Abbotsholme YFC and Leek YFC taking joint second. This competition involves the team debating questions which are topical at the time. Each team chairman has a selected batch which contain six question topics, three of a general nature and three on rural affairs, from which they select three for discussion by the team. One question must be selected from each section plus one other. The Chairman has no prior communication with the team about the questions they have selected to be discussed. The competition makes for a great debate with subjects including Brexit and the effect on Agriculture, HS2 and Social Media amongst many others. The first and second placed teams in these competitions will go forward to represent Staffordshire at the West Midlands Area Finals in on 24th February, which is this year being hosted by Staffordshire. Also, on Sunday, the County round of the including Member of the Year (17 and Under) and Male and Female Member of the Year (18 and Over) were held. Toby Hall of Abbotsholme YFC was the winner of the 17 and under Section. Toby has been an active member of Abbotsholme Young Farmers for seven years and he has held the role of Club Chairman during this time. Competitors were required to complete a Synopsis Form giving details of their activities within YFC over the previous 12 months as well as information about school, career aspirations, and activities outside YFC. An informal interview and power point presentation also took place on the day. In second place was Maisie Tinwell of Leek YFC and in third place was Alice Boothby of Uttoxeter JNFU. Both Toby and Maisie will go forward to represent Staffordshire YFC at the West Midlands Area round being held on Sunday 3rd March 2019 at Oakengates Theatre, Telford. The Female Member of the Year was won by Gemma Brookes a past Club Chairman of Uttoxeter JNFU. Gemma has been a member of Staffordshire YFC for eight years. Awarded second place was Beth Walford, currently the Club Secretary of Chase YFC. Beth has been a member of her local club for two years. In third place was Izzy Proctor of Leek YFC who has been a member for three years and currently the Club Secretary for Leek YFC. The Male Member of the Year as won by Johnathan Wilson of Uttoxeter JNFU for the second year running. Johnathan is 26 years of age and has been a member for 13 years. Rob Mollatt also of Uttoxeter JNFU came second and Dan Moseley of Eccleshall YFC was placed third. Senior competitors were required to complete an information sheet giving details of their experience with Young Farmers and attend an interview with the competition judges on the day. All the judges on the day commented on the high standard of competitors and felt that the federation had some very enthusiastic and confident members to take on roles in their clubs in the future. Johnathan and Rob will also represent Staffordshire YFC at the West Midlands Area round on Sunday 3rd March at Oakengates Theatre, Shropshire. To round off a great day of Competitions, there was also a Ballroom Dancing Competition in which Ashley YFC took first place with their choreographed routine which followed the NFYFC Rules, where teams had to perform a Show Dance to open a show (like Strictly Come Dancing). The Team had to perform two genres from Ballroom, and two genres from Latin. In second place was Eccleshall YFC and Chase YFC came third. Another NFYFC Competition held at the end of a very busy day was the Show Choir which again is part of the National Competitions Programme for YFC this year. In this competition, Uttoxeter JNFU sang their way to first place with their rendition of “Stand by Me” followed by “Meet me on the East Side.” In second place was Eccleshall YFC and Chase YFC took third place. Teams placed first and second in the Ballroom Dancing and Show Choir will also go forward to the West Midlands Area round which is being hosted by Staffordshire YFC on Sunday 24th February. 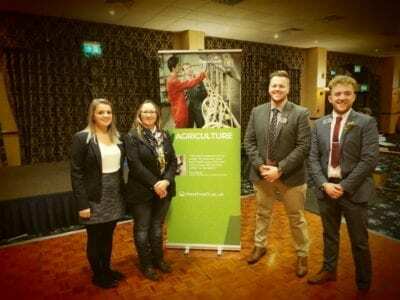 The day of competitions held on Sunday is a great example of the opportunities which all YFC members have to develop their public speaking skills, take up new competitions and meet like minded young people from across the county.